The show opened with a less than full crowd for Lonelytheband. If you’ve been listening to any Spotify playlists or even alternative radio lately, you’ve no doubt heard their hit ‘Broken’. The traffic was certainly a factor as most of the amphitheater was probably sitting on 77 but whether it was the heat, the lack of audience, or both, I kept waiting for the energy to get turned on but was left disappointed. As the crowd filled in, so did the clouds. It looked pretty serious for an hour or so but we never felt a single raindrop. However, patrons over at PNC Music Pavilion had a different and unfortunately less-dry situation. I was a little curious to see what the set production would be like for Vance Joy. For an artist that primarily plays solo and on a ukulele or acoustic guitar, I was wondering how he could take up a full amphitheater stage for well over an hour. He played his first song in darkness with two beaming white lights behind him and the image from his latest album release hung above. It didn’t take long for the crowd to go wild, all he had to do was flash that Australian smile and I swear I heard hearts skip beats. Speaking of smiling, that’s all he did, the entire time. You can truly tell that Vance Joy (aka James Koegh) truly enjoys performing and fan interaction. All throughout his set he was making eye contact with fans and smiling from ear to ear. When an artist loves what they’re doing, it doesn’t just make the show better, you can FEEL their passion. As his soaring voice echoed off the facades of the Music Factory, the clouds cleared and the stars came out (or what would be stars if you could see them.) It was a magical performance except the unseasonal heat and humidity. If I didn’t have the skyline of uptown to guide me, I would have thought I was back in Alabama. Sweating or not, everyone was dancing. 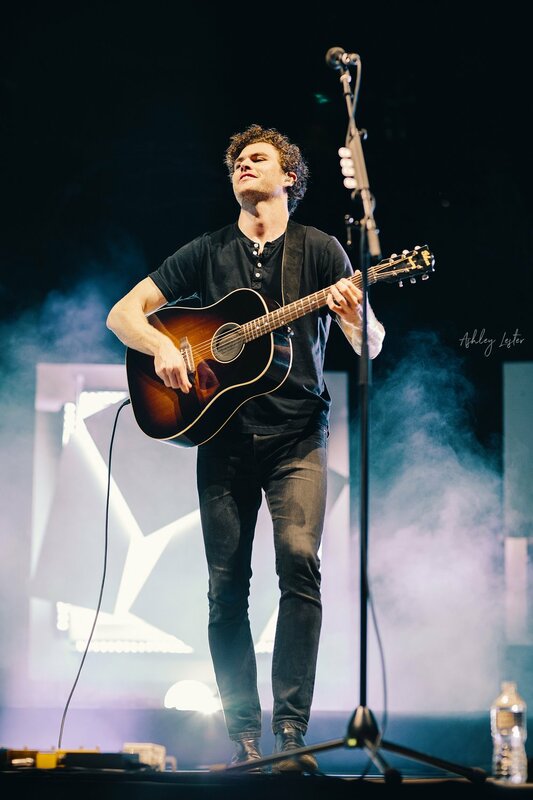 Especially when Vance Joy covered a delightful rendition of “All Night Long” followed by Justin Bieber’s “Sorry” – It mixed it up and re-energized the crowd enough for the last 5 songs which included all of his hits such as “Rip Tide”, “Lay It On Me” before finishing the set with “Saturday Sun”. His performance was one of those hair-raising, goosebump inducing, tear-welling experiences that had you in your car after the show re-playing every song just to relive it. You can hear his latest album Nation of Two on Spotify.